The members of the Monte Piano Trio have performed in major concert halls such as the Berlin Philharmonie, the Laeiszhalle in Hamburg, the Alte Oper in Frankfurt, the Wigmore Hall, the Royal Festival Hall and Covent Garden in London, Daning Theatre in Shanghai and the Romanian Athenaeum in Bucharest. Their performances have been broadcast on television and radio by BBC, CBS, BR, DLF, SWR, TVR and Radio Clásica. In addition to being invited to play at festivals in the USA, Brazil and numerous European countries, the trio has also already received invitations to perform at festivals including the Schleswig-Holstein Musik Festival, the Mozartfest Würzburg, the Festspiele Mecklenburg Vorpommern, and the Heidelberger Frühling. They are the founders and artistic directors of the Kammermusikfest Sylt, which has taken place annually on the North Sea island since 2012. The trio released its new CD From a Tender Age with the GENUIN classics label in 2015 to much acclaim; the recording was recommended by Fono Forum and chosen as CD of the Month by Stereo Magazin. In June 2015, the Monte Piano Trio had the privilege as Monte+ of premiering the recently rediscovered first piano quintet by George Enescu at the the national museum “George Enescu” in Bucharest. In addition, they appear on the soundtrack of the film Maestro, a documentary film which explores the life of musicians through the eyes of Paavo Järvi. 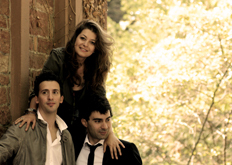 The trio was founded at the Frankfurt University of Music and Performing Arts in 2008. It won first prizes at the Mirabent Competition in Spain and the European Competition in Karlsruhe. Additionally, the trio received awards at various international competitions, including Schumann (Germany), Maria Canals (Spain), Brahms (Austria) and Almere (Holland). In the summer of 2011, the trio received a post-graduate degree in chamber music with distinction under Dirk Mommertz at the Folkwang University of the Arts in Essen, before completing a two-year Masters program with the highest grade at the renowned International Institute of Chamber Music of Madrid under Ralf Gothóni in 2013. The trio has also been musically inspired by Menahem Pressler, Eberhard Feltz, Günther Pichler, Ferenc Rados and the Fauré Quartet.